System dynamics is a mature mathematical modeling system for analyzing and graphing the dynamics that describe how a system functions. This site covers qualitative methods of thinking about the future, no mathematical modeling, so in this site, system dynamics will be used in its broader cognitive function as a method for sharpening our thinking, for improving the quality of the mental model we all inevitably, as thinking creatures, carry in our heads. Scenario analysis, system dynamics, complexity can be thought of as three increasingly powerful lenses for viewing system behavior. Scenario analysis concentrates on events, which are easily seen but represent the least detailed of three distinct perspectives on reality. The underlying causal dynamics constitute a “second lens,” with more powerful magnification. The more we concentrate on the underlying dynamics that produce the scenarios rather than the events that describe them, the more powerful scenario analysis becomes. (Details are in my “Future Analysis” paper presented at the 2007 International Studies Association Convention.) Focusing on dynamics begins to reveal how things work, how distinct causes interact, where tipping points can be anticipated, and the impact of delays. If system dynamics, i.e., the study of underlying causality, can be integrated into scenario analysis, it will carry scenario analysis from its tradition and highly unsatisfactory static, unscientific state a big step toward becoming a dynamic and scientific method. Choices exist for the future of Palestine, if leaders will consider them. below to illustrate how such integration might be accomplished. 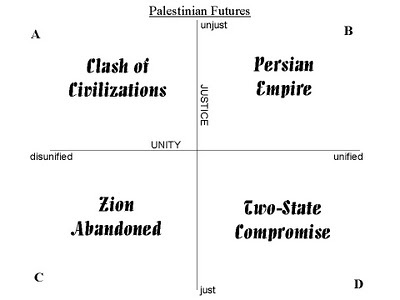 On the basis of the degree of “justice” and “unity,” four possible scenarios for the future of Palestine are derived. The first step, traditional scenario analysis, can now be used as the basis for investigating the underlying dynamics, at which point it becomes important to focus on such concepts as “time delays” and “tipping points.” Each will be discussed below. Delays are a critical consideration in the analysis of dynamics. For example, the dominant dynamic the day after a successful invasion is likely to be the fear of the conquered society, but over the longer term the dominant dynamic is likely to be resistance, something that may be discounted by a naive and overconfident conqueror because immediately following the invasion it may be invisible. Ignoring delays can be fatal, as many leaders in history have discovered. 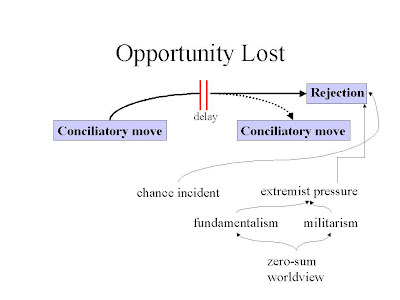 Delays can, as another example, be expected to have significant impact on the “Zion Abandoned” scenario (see chart, above) because movement toward such a fundamental shift in Israeli attitudes will require many small, careful steps in the direction of mutual trust. 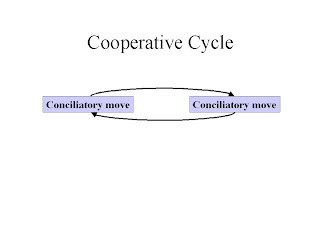 A “cooperative cycle” of conciliatory move by Side A being met by a conciliatory response by Side B, leading again to a positive step by Side A, etc. must develop. Although such a conciliatory cycle is likely to create a positive sum (win-win) situation, in the real world, even given good will on both sides, it will be difficult to achieve because delays will be almost unavoidable, and delays open the door to all manner of problems. Opportunities will abound for extremists who wish to exploit chaos and fear for personal gain or see the world in terms of good and evil to sabotage every step. One side will make a conciliatory move, and the other will hesitate, opening the door for extremists of various stripes who believe in using force to achieve their goals and see the world in simplistic terms of good and evil(either fundamentalists with a religious mission or militarists). And aside from zealots, equally serious interference can come from careerists who profit from arms sales or exploit the threat of war or terrorism to win elections. Moreover, any chance incident can be misinterpreted as a negative signal by the other side, negating the previous conciliatory move. Even if the interference of extremists or careerists is avoided, when delays occur or when the two sides move at different tempos, confusion about the other side’s intentions becomes difficult to avoid, everyone falls back on “playing it safe,” and the momentum toward peace evaporates. These complications resulting from delay are one of the main reasons why “Zion Abandoned” is a long shot. Both “Zion Abandoned” and “Two-State Solution” are stories about the slow emergence of mutual trust. Each scenario is vulnerable to a sudden tipping point that could cut it short, should violence erupt. The key to this argument is recognition that the desire for democracy among Iranian youth is a tendency that already exists as an Iranian political force, albeit subordinate to the currently dominant tendency of enhancing Iran’s role as a backer of Palestinian liberation. Therefore, although occurrence of the tipping point that would give Iranian proponents of democracy/civil liberties control of their government would be a major change in Mideast affairs, all it would require is a change in the relative power of two forces that are already in conflict. From a methodological perspective, the point is to draw attention away from the traditional storyline of scenario analysis and focus instead on the underlying dynamics of the various story lines in order to identify how conflicting driving forces interact and thus where tipping points exist that could shift dominance of behavior from one driving force to another. “Integration” of the two methods, scenario analysis and system dynamics, that are traditionally thought of separately and almost always used by different specialists, is fundamentally a simple but important cognitive issue of recognizing that building scenarios is just the first step toward the far more important task of identifying the underlying causal dynamics. Instead of (or immediately after) asking what one imagines might happen, one should ask how such circumstances might arise. This question will immediately move the investigator into the sophisticated world of system dynamics, which is well treated by the many specialists in that field, including CIESD and John Sterman. Here, the objective is to provide an introductory graphical illustration of the innovative concept of integrating system dynamics with scenario analysis. 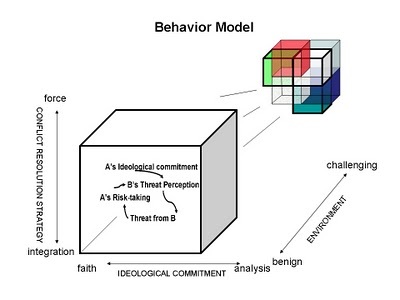 The “Behavior Model” image shows in the background a three-axis scenario analysis, with, in the foreground, a single scenario of interest expanded. This scenario represents the idea of drilling beneath the surface of a scenario to investigate the underlying causal dynamics. Inside the scenario lies a causal loop diagram depicting the dominant causal dynamic for that scenario. Once this exercise is carried out for each of the eight scenarios, one will be able to contrast the dominant dynamics of each. The next major step would be to identify the various subordinate dynamics with a view to thinking about the circumstances under which one of them might emerge as the new dominant dynamic (i.e., finding the tipping point). This analytical process is obviously extremely complicated since there may be numerous dynamics of potential importance hidden by the dominant dynamic, so any graphical technique that helps to organize information and minimize the risk of overlooking hidden explanations is valuable. The essential point is that while current behavior in a real situation may be easy to understand (e.g., all actors are scared and thinking only of security), at any moment that simplicity could shift without warning (e.g., the threat recedes just enough to allow thoughts of personal profit to become the primary motivating factor). Even this brief look at the causal dynamics impacting the evolution of events makes the point that the political situation is far from equilibrium, like a steep mountain slope after a heavy snow. But the political slopes fall away in all directions; a delicate hand may nudge events in any of several directions and create a future that once seemed all but impossible. My “Future Analysis” paper at ISA.